“Barbara Stanley’s eponymous business is London’s main outlet for contemporary work by Irish painters and sculptors. Her international private and corporate clients are always eager for new work so Barbara is satisfying that demand with a show that presents a plethora of subjects by some of their favourite artists. Among them is Brian Ballard whose artistic style I would equate to that of a dramatic sunflower rather than a delicate primrose. The minimum of broad brushstrokes develop strong colouring effects that result in emotive landscapes or still lifes. In contrast, Jimmy Lawlor’s intricately painted, everyday scenes reveal brilliant observational and painting skills. At first, they induce nothing but well-deserved admiration, then the humorous element strikes, leaving the viewer incapable of restraining a broad smile and chuckle. A perfect example is One for the Road that places a group of adorable, nonchalant donkeys in a meticulously painted rural setting; one of them dominates the foreground, his head cocked and legs slightly oddly bent as if he has had ‘one too many’. 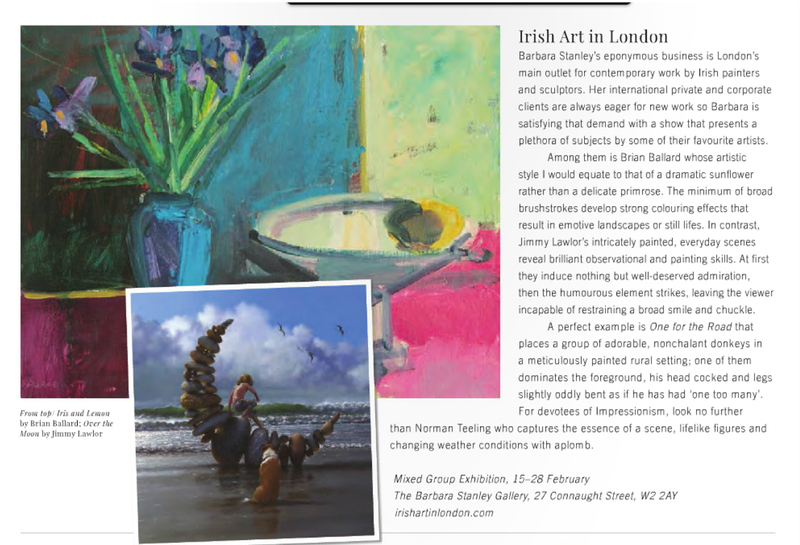 For devotees of Impressionism, look no further than Norman Teeling who captures the essence of a scene, lifelike figures and changing weather conditions with aplomb.